This photo shows some of our rough green jasper. The rough in the photo above is wet to show full color. This is a deep green jasper with zones of white and translucent agate and quartz. You might find a few pieces with a little bit of red or yellow. It can be tumble polished to a very bright luster. See the photo below of a batch that we tumbled and the polishing procedure that was used. This mix is perfect for the beginner. It has a range of particle sizes from approximately 3/8" (9 mm) to 1 1/2"" (38 mm) and should require little to no preparation before tumbling. 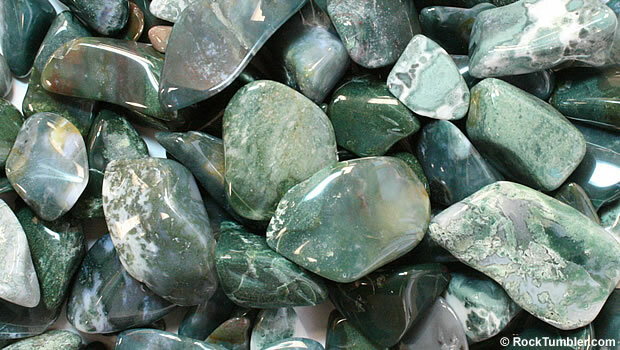 We recommend TXP polish for polishing all types of jasper. 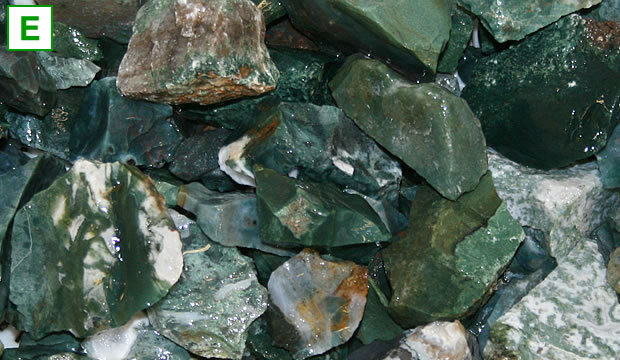 This green jasper has been crushed and sized to perform well in small rotary tumblers such as the Thumler's MP-1, A-R1, and A-R2. The size range gives the material a good tumbling action and eliminates the need for ceramic media. Our EASY Rock Tumbling Recipe works well for rough that has a Mohs hardness of 7 and has been crushed to a variety of particle sizes under about 1 1/2 inches. This is a photo of some Green Jasper that we polished. The mix of white agate made some interesting stones.